Splitting wood is deeply satisfying work. And while it can be rewarding to split a pile of firewood by hand, we love the convenience of a wood splitter – and our backs love getting a break, too. So here’s our guide to finding the best wood splitter available. There are quite a few log splitters available, and the variety of technical specifications and requirements can be somewhat dizzying. That’s why we put our top 5 wood splitters to the test. Because they’re far more expensive and therefore harder to compare to other splitters, we haven’t reviewed any gas-powered splitters in this list. Pow’ R’ Kraft 65556 is a well priced electric log splitter. It sports a 1,500 watt electric motor and reportedly can split logs up to 12 inches in diameter. 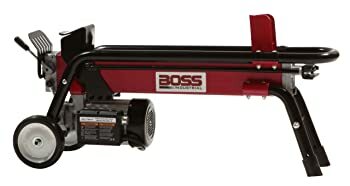 Boss Industrial ES7T20 Electric Log Splitter features a 2 HP electric motor and automatic anvil return. Although it boasts 7 tons of splitting force, it can safely run on a 15 amp circuit. 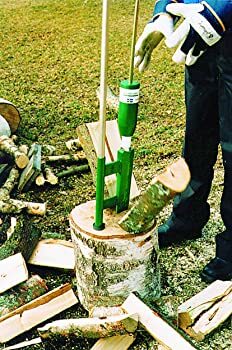 Woodeze 5MH-SPLITTER Super Firewood Splitter could split rounds up to 16 inches in diameter. For that reason, we included it in our list of products to try out. Powerhouse XM-380 Electric Hydraulic Log Splitter has the most powerful motor of all the wood splitters we tried. We were excited to see what that kind of force could do. 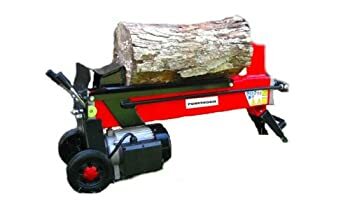 WEN 56206 6-Ton Electric Log Splitter is another small splitter, with a 2 HP engine. It somehow manages a splitting force of 6 tons, however, so it has the potential to be a competitive entry on our list. This is our favorite splitter, and it also happens to be the cheapest electric splitter on our list. 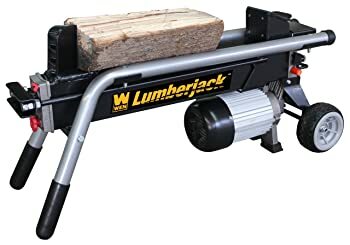 The price, combined with its ability to chew through most types of wood, makes it the best electric wood splitter value we’ve seen. It’s constructed entirely from steel and offers a splitting force of 4 tons at 1.75 horsepower. Though this may not seem like a lot of force, it was able to split everything we put in front of it. Weighing in at 95 pounds, this is the lightest electric splitter we reviewed. This made it very easy to move around and set up. Although the manufacturer states that it can split logs up to 12 inches in diameter, we found that we could easily split much larger logs by working around the edges. We successfully split a 22-inch cherry log with this machine! The two-handed operation seemed a bit awkward at first, but it’s a useful safety feature that keeps the user behind the wedge and out of harm’s way. And once we got used to it, we found that we preferred it to the single-handed alternative. Coming in at second place, this little beast bumps the power output up to 2 HP and offers 7 tons of splitting force. It also features an automatic ram return. So why didn’t this splitter make it to first place? The price is the primary limiting factor. At around twice the price of the Pow’ R’ Kraft, we felt that the increase in power is not worth the increase in price. That being said, this is a fantastic electric splitter. Though we had a harder time getting knottier logs to make it through, we split most of our pile without any issues. Like the Pow’ R’ Kraft, we were able to split some truly gigantic logs easily. The design of this splitter facilitates working around the edges of larger logs until they’re small enough to send through normally. Okay, we know what you’re thinking: This is not an electric splitter. But we enjoyed using the Woodeze so much that we had to include it in this list. The main drawback of an electric log splitter is that it requires a reliable 15-amp power supply. But what if that’s not available where you split your firewood? Enter the Woodeze Super Firewood Splitter. Using a weight-driven splitting wedge, this little splitter mounts atop a hardwood stump. 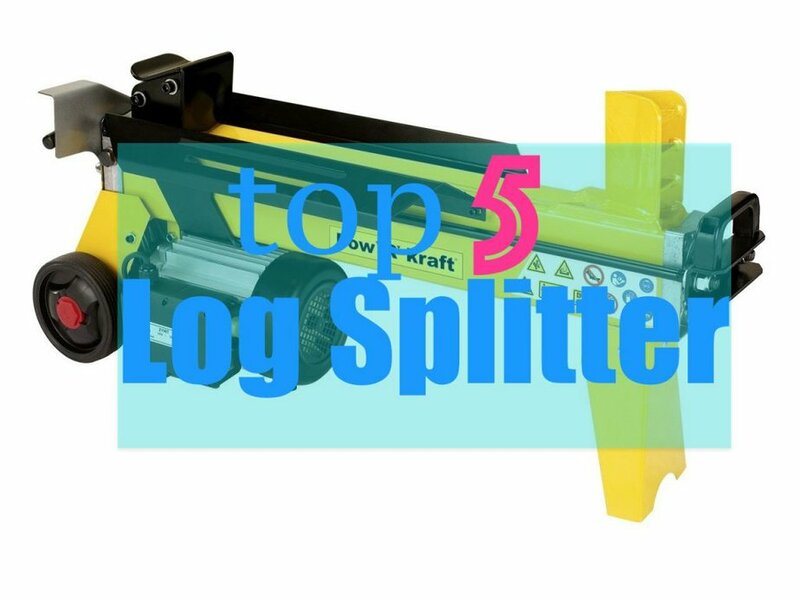 Operating the splitter is very simple: Lift the striking weight and drop it onto the log. While larger rounds took a few attempts, we were able to split a few 16-inch logs with this thing. However, we weren’t able to split anything in the 20-inch range. For that reason, we wouldn’t consider this the #1 log splitter available. This 3HP, 7 ton electric splitter performed very well when splitting especially long rounds. Although it chewed through most hardwood logs with ease, we did notice some problems with its power draw. If you’re interested in this log splitter, you should know that it has a relatively high power requirement. The 19.5-amp engine means that at 25-amp or higher circuit will be necessary to follow most electric safety guidelines. But if you do have the power to run it, it’s a decent splitter. It struggled with very knotty wood but handled everything else with ease. Although it’s in last on our list, this electric splitter packs a considerable amount of power into a small package. With a 2 HP motor and 6 tons of splitting force, the WEN is worth a look. The first thing we noticed is that it’s very easy to push around. The wheels are spaced well and it features designated rubber handles, a feature that’s missing from the other products we tried. However, it is limited in the log size it can handle. We split a few 18-inch rounds without much difficulty, but anything larger needed to be carved up manually first. This seems like a waste of this splitter’s generous horsepower. Although wood splitters are offered in a huge variety of styles and technical specifications, there are a few simple factors to consider when you’re looking for one. If you only need to split wood a few times a year, you can probably get by just doing it by hand. But what if you’re regularly confronted by giant piles of logs that need to be processed into firewood? What happens if you can’t physically split all that wood manually? That’s where motorized splitters come in handy. The cheapest electric log splitters are priced in the low $200 range, whereas the more expensive models can cost as much as $2,000. Note that more expensive splitters are not necessarily better, but rather suited to different needs than their cheaper counterparts. When it comes right down to it, the type of splitter you should buy depends on the type of wood you typically need to split. The best electric wood splitters perform well in the sweet spot, which is around 12 inches in diameter but can go up to 20 inches. Furthermore, electric splitters are well-suited to most hardwoods. If you tend to split a lot of very dense wood, such as green hickory, you’ll probably want to invest in a splitter with a more powerful motor. Unfortunately, if you often need to split wood that’s larger than 20 inches in diameter, an electric splitter just won’t cut it. You will either need to split the larger pieces by hand first or invest in an expensive gas-powered splitter. Electric wood splitters are ideal for anyone with a reliable, residential-grade power supply. If this is not available to you and a gas-powered splitter is out of your price range, the third product on our list may be a good choice for you. Pow’ R’ Kraft 65556[/easyazon_link]. This little machine makes the most of its affordability, power and functionality. Pow’ R’ Kraft also demonstrated attention to their customers when they strengthened the 65556’s packaging in response to customer complaints. In terms of horsepower and splitting force, we didn’t notice a significant increase in splitting ability across the spectrum of electric wood splitters. 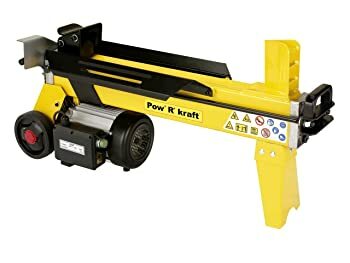 Quite the opposite: Anything that the more powerful electric log splitters could handle, the Pow’ R’ Kraft 65556 could split just as well.